Are you looking for a unique countertop material to complete your kitchen? Butcher block is the answer. This beautiful wood product can be used in rustic-inspired kitchens to add that old-fashioned farm feel or can even be used in sleek, modern kitchens to offset metal surfaces and appliances. 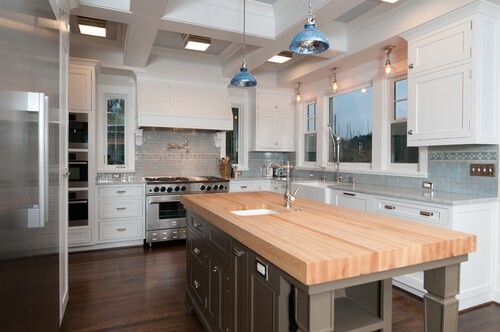 At Gipman Kitchens & Cabinetry, we can create and size custom butcher block countertops for your Kootenay home. All of our countertops are produced locally. Butcher block countertops are made from straight cuts of wood that are then glued together into a thick slab. The material and construction of these countertops make them a very stable and sturdy working surface for your kitchen. Butcher block can be constructed from nearly any type of wood. While maple is the most popular due to its sturdiness and clear grain, cherry and black walnut are also used for their rich colour. A lacquered butcher block finish is very popular due to its strength and lower maintenance. This finish is not food safe, which means that it is recommended you use a cutting board and do not directly cut on the surface. However, since the finish is quite durable, and you should not be cutting directly on it, it has a lower maintenance requirement than oiled. 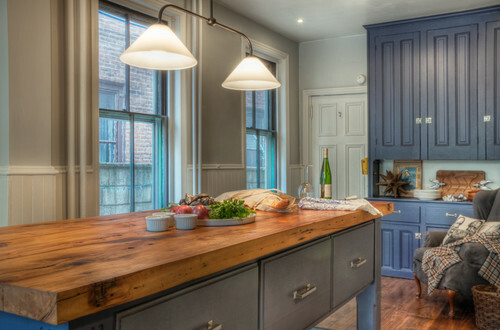 An oiled butcher block finish is very popular due to its beauty and function. This finish is food safe, which means that you can forgo a cutting board and directly cut on the surface. However, since the finish does not seal the wood in the traditional sense you must be careful of what you set on the surface and regularly oil it to keep it from drying out. Wood countertops do require a few maintenance tasks to keep their beauty over time. Unlike some other countertop materials, wood is a very porous material, so it has to be sealed properly. Without sealing, germs are able to easily get into the material through the surface. Once inside, germs will continue to grow, making your countertop unsafe and destroying its beauty. Once your countertop is installed, you will want to have it sealed and you should maintain the surface with mineral oil or another protectant. Countertops will also have to be refinished after about 10 of use depending on how heavily they are used by your family. You must also not allow moisture to sit on the surface of your wood countertop for an extended period of time. Spills and other moisture should be cleaned up and dried from the surface quickly. Otherwise you could notice water damage, which will make the surface more susceptible to germs. Because wood is a soft material, you may notice dents, dings or scratches developing over time. While some may not like this look, many choose wood countertops for this exact reason, as they like the appearance of the rustic patina wood acquires over years of use. Wood countertops are an excellent option for kitchens as they make a strong and sturdy work surface. If you choose, you can cut food directly on the countertop as many of the styles will disguise small scratches and cuts. The soft material of wood is also much easier on the blades of your knives than granite or stone would be. 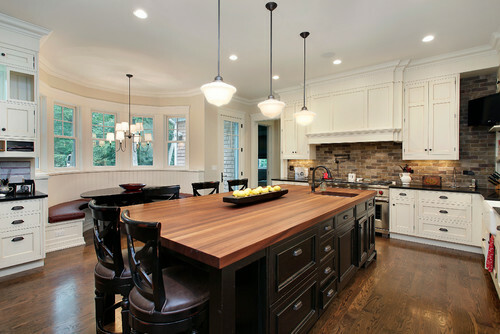 Butcher block countertops can bring warmth to your kitchen, not just in the warm tones and appearance of the wood. The surface is much warmer to the touch than that of granite, tile or stone. If you are planning to use the countertop as an island that people can sit around or eat at, wood is a great option since placing your arm on a cold granite countertop can be quite a shock. Something many people do not consider when deciding on solid wood countertops is the amount of wear and damage that they can take on. A great alternative to constant worry and maintenance is going with a laminate countertop with a high definition printed wood pattern. You maintain the cost effective nature and high durability of the laminate, but can achieve the high end look of wood! All these images are of laminate countertops with the high definition wood grain patterns!